In the search for pollen diagrams from NE Germany for the study of patterns in vegetation and sedimentation during the Weichselian Lateglacial it was discovered that many unpublished palynological data from the period of the German Democratic Republic are preserved in archives of research institutions. In order to save these data from sinking into oblivion and to make them available to the scientific audience, part of this material was digitalised and published. Franz Fukarek worked for many years at the Botanical Institute of the Greifswald University and was well-known and widely praised as plant-sociologist and geobotanist. Additionally, he was devoted to palynology and carried out some playnological investigations in the 1960-ies, but was summoned from above to give this research less priority and to focuss on his other tasks. For this reason, most of his palynological studies were never published. Hand-drawn versions of pollen diagrams from the Friedländer Große Wiese area (Vorpommern) were already found a few years ago in the Institute of Botany and Landscape Ecology of the Greifswald University and were recently revised and re-interpreted by De Klerk (2004a) (sites GAL, HWD, HTT and MOO). Shortly after this publication, the original counting lists of these sites were found and allowed a digitalisation of the complete datasets, of which the diagram "Ahlbecker Seegrund" (AHL) was recently presented by De Klerk (2005a). A further diagram from the Moorer Busch in the Grevesmühlen area (NW Mecklenburg) has been prepared for publication (De Klerk 2007a). A conspicuous characteristic of the Fukarek-data is the high temporal resolution that outshadows numerous more recent pollen diagrams, thus providing a detailed picture of vegetation history. Klaus Kloss worked at the "Brandenburgisches Landesmuseum für Ur- und Frühgeschichte" in Potsdam and carried out research mainly in archaeological contexts. Much of his studies were never published: his planned publication after his retirement was hindered by severe illness. A cooperation with the "Brandenburgisches Landesamt für Denkmalpflege und Archäologisches Landesmuseum" allowed digitalisation and publication of part of his impressive dataset. Recent publications included pollen diagrams from the Repten area, from Hennigsdorf (SHW), from the Kalksee (BWL), from the Slavic fortification "Grodisch" in the Odra valley (WIE), the Teufelssee near Potsdam (RTS), a site near Uhyst (for references: see below). Data of several other sites are currently in preparation for publication, which originate from the Germanic settlement near Dallgow (DLG), from the Bornstedter See in Potsdam-City, and from the Dubringer Moor near Hoyerswerda (Sachsen). Also digitalised were the ca. 25 pollen diagrams from the sheet "Thurow" of the German topographical map 1:25000 of Germany, which were analysed by H.M. Müller in the late 1950-ies/early 1960-ies at the forestry school of Eberswalde and wereincorporated in her unpublished PhD-thesis (Müller 1961), and about 20 of the ca. 40 pollen diagrams of Rügen Island published by Lange et al. (1986). For this material, a revision and publication is not planned. De Klerk, P. (2004a): Vegetation history and landscape development of the "Friedländer Große Wiese" region (Vorpommern, NE Germany) inferred from four pollen diagrams of Franz Fukarek. Eiszeitalter und Gegenwart 54: 71-94. De Klerk, P. (2004b): The pollen diagram "Repten CRep 89/2" (Niederlausitz, S Brandenburg, E Germany) from the legacy of Klaus Kloss. Archiv für Naturschutz und Landschaftsforschung 43(4): 9-17. De Klerk, P. (2004c): A pollen diagram from a kettle-hole mire near the Kalksee (N Brandenburg, NE Germany) from the legacy of Klaus Kloss. Archiv für Naturschutz und Landschaftsforschung 43(4): 19-28. De Klerk, P. (2005a): A pollen diagram from the Ahlbecker Seegrund (Ueckermünder Heide, Vorpommern, NE Germany) from the legacy of Franz Fukarek. Archiv für Naturschutz und Landschaftsforschung 44(3): 93-108. De Klerk, P. (2005b): Vegetation history and landscape development of a dune area near Uhyst (Oberlausitz, E Germany) in the Lateglacial, Early Holocene, and Late Holocene: a new interpretation of a pollen diagram of Klaus Kloss. Archiv für Naturschutz und Landschaftsforschung 44(3): 79-92. De Klerk, P. (2006a): A pollen diagram from the Teufelssee near Potsdam (C Brandenburg, NE Germany) from the legacy of Klaus Kloss. Archiv für Naturschutz und Landschaftsforschung 45(1): 23-35. De Klerk, P. (2006b): Lateglacial and Early Holocene vegetation history near Hennigsdorf (C Brandenburg, NE Germany): a new interpretation of palynological data of Klaus Kloss. Archiv für Naturschutz und Landschaftsforschung 45(1): 37-52. De Klerk, P. (2007a): A pollen diagram of the "Moorer Busch" near Grevesmühlen (NW Mecklenburg, NE Germany) from the legacy of Franz Fukarek. Archiv für Naturschutz und Landschaftsforschung 46(4): 3-16. De Klerk, P. (2007b): Lateglacial and Holocene vegetation history around a terrestrialised bay of the Blankensee near Schönhagen (C Brandenburg, NE Germany) inferred from a pollen diagram of Klaus Kloss. Archiv für Naturschutz und Landschaftsforschung 46(1): 27-40. De Klerk, P. (2011-2012): Lateglacial and Holocene vegetation development and fluvial dynamics in the Odra valley near the Slavic fortification "Grodisch" of Wiesenau (Brandenburg, E Germany) inferred from a pollen diagram from the legacy of Klaus Kloss. Veröffentlichungen zur brandenburgische Landesarchäologie 45: 131-142. De Klerk, P. & Joosten, H. (2016): Vegetation history and mire development in the northwestern part of the Dubringer Moor near Hoyerswerda (Sachsen, E Germany) inferred from a pollen diagram from the legacy of Klaus Kloss. Mauritiana 30: 77-95. Lange, E., Jeschke, L. & Knapp, H.D. (1986): Ralswiek und Rügen. Landschaftsentwicklung und Siedlungsgeschichte der Ostseeinsel. Teil I: Die Landschaftsgeschichte der Insel Rügen seit dem Spätglazial. Akademie Verlag, Berlin. 175 pp. + appendices. 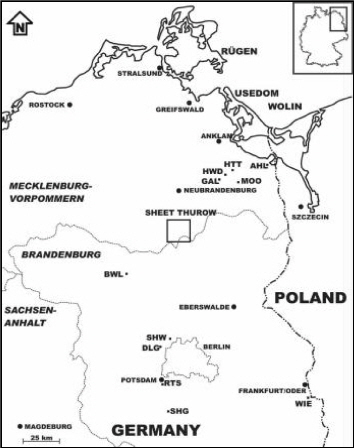 Müller, H.M. (1961): Pollenanalytische Untersuchungen im Bereich des Meßtischblattes Thurow/Südostmecklenburg. PhD-thesis, Halle University, 203 pp. + appendices. Van Asch, N., Kloos, M.E, Heiri, O., de Klerk, P. & Hoek, W.Z. : The Younger Dryas cooling in northeast Germany: summer temperature and environmental changes in the Friedländer Große Wiese region. Journal of Quaternary Science 27: 531-543.